"Now when the sixth hour [12 noon] had come, there was darkness over the whole land until the ninth hour [3:00 p.m.] And at the ninth hour Jesus cried out with a loud voice, saying, "Eloi, Eloi, lama sabachthani?" which is translated, "My God, My God, why have You forsaken Me?"... " And Jesus cried out with a loud voice, and breathed His last. Jesus died on the cross at about 3:00 p.m. in modern time on Friday, according to the Scriptures. In "The Sign of Jonah," I explained how Christ was in the heart of the earth for "three days and three nights," crucified on Friday and rose again on Sunday. It was given to me from God when I asked Him to explain on behalf of a group of atheists. Because of it, I received death threats and for a time had a price on my head. Now that many pastors have researched and preached it themselves, others have accused me of stealing it from pastors! It is AMAZING the lengths that people will go through to avoid the truth and/or run from God. But this morning, on Good Friday, I was reading the Scriptures and saw something I missed that further confirms what He showed me. "Then came the Day of Unleavened Bread, when the Passover must be killed." (Luke 22:7) Luke then describes Jesus and the apostles breaking bread at Passover on the night He was betrayed, which I had explained was the night Christ "entered the heart of the earth." Think about that. "When the Passover must be killed." How did Jesus, as the "Passover Lamb" get killed on the night He must be killed? He was crucified the next morning, He died on the cross at 3 p.m. the next afternoon. Was that just an oversight? No, not at all. Just as Adam and Eve were not struck down dead when they first ate the fruit in the Garden of Eden. There was a spiritual death, a separation from God, and was the reason that Christ came for us, to bring back life through His suffering, death and resurrection. Everything to the slightest detail is fulfilled in the Scriptures. And when Jesus took bread, gave thanks and broke it, gave it to His disciples saying "This is My body which is given for you; do this in remembrance of Me," He knew that He would announce just a little later: "But this is your hour, and the power of darkness," as He was offered up as the Lamb to the soldiers. At that moment He was without blemish but not for long...the blood started to flow immediately after that. Since writing the article in 2003, I have been to Israel and saw for myself how close Caiaphas' courtyard was to the Mount of Olives and the Garden of Gethsemane in Jerusalem. Until that trip, I wondered at how Jesus could have been marched to Caiaphas, Pontius Pilate and Herod all in one night and then crucified at 9:00 a.m., but Luke explains it. "As soon as he knew that He belonged to Herod's jurisdiction, he sent Him to Herod, who was also in Jerusalem at that time." (Luke 23:7) These places were just steps away from each other. It is stunning to witness God reveal facts if you ask Him. I cannot understand why people fight so hard to resist the truth of the Gospel of Jesus Christ. We need a Savior and He came. If there was any other way for justice to be done without payment for our sins, Jesus would not have had to go to the cross. But payment for you and me has been paid, God became flesh Himself and paid that price. Why, oh why, do so many refuse to receive it? 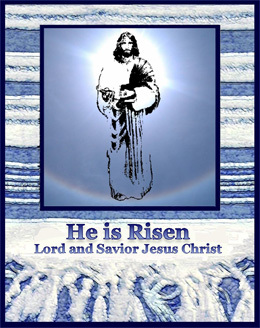 God bless you and keep you this blessed Sunday, for He is Risen!